At Allpro Contracting, our Southwest Chicago remodeling contractors believe that every family should get the fullest enjoyment of its home. This means that you should be able to use both the interior and exterior of your property. If you and your family have not been utilizing your yard, you should consider building a new deck in Southwest Chicago. A well designed and maintained deck is the perfect transitory point between the interior and exterior of your home. It can be used for any special events or parties that you host at your residence. At the same time, a deck can provide the perfect vantage point from which your family can enjoy your yard. If you are interested in deck building in Southwest Chicago, you should call our professionals for help today. We are adept at design and constructing both wood and composite decking. 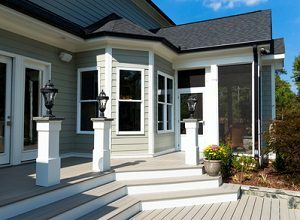 Our experts have provided the following information about composite deck materials to help you get your project started. Our staff would be happy to take your call, to answer any of your question, and to schedule your appointment today. Composite decking is an amazing alternative to traditional wood building materials. This material is made from wood scraps and plastic particles. Many are made primarily of recycled content. Composite decking is treated with chemicals to prevent rotting, molding, and mildew. The are dyed and imprinted to mimic the natural warmth and beauty of wood. Because composite decking is so durable, it is often covered by amazing warranties. Although a natural wood deck is a thing of beauty, there is often one primary complaint about these features. After a few years of exposure to the elements, every wood deck will develop some form of degradation. At Allpro Contracting, our Southwest Chicago remodeling contractors are here to help. We can repair, clean, and refinish a wood deck as need be. However, if you let your wood deck go for too long, it can become quite the eyesore. If, however, you choose to install a composite deck around your property, you will not have to worry about this routine need for maintenance. The material does not splinter or rot, and it is impervious to mold and mildew growth. If you need to hire a professionally licensed contractor for deck building in Southwest Chicago, call Allpro Contracting today at 708-658-3500, or fill out our online request form.